Happy hump day! We are half way through the week already! I am obsessed with this off the should little red dress. 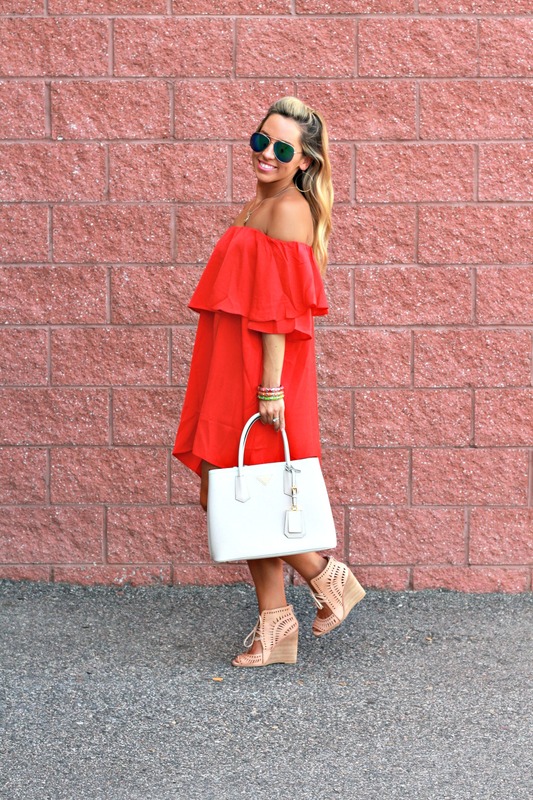 The high low hem and the ruffle overlay on top is so flattering and easy to wear! I paired it with some summery wedges but it could even be paired with some gold sandals, or cute booties for fall! It’s seriously only $15 and I’ve already worn it three times. The bright red color is really fun to mix with neutrals, like my shoes & handbag, and other bright colors like these stackable bracelets and fun sunglasses. If you haven’t shopped from Shein yet I highly recommend them for extra affordable trendy clothes.